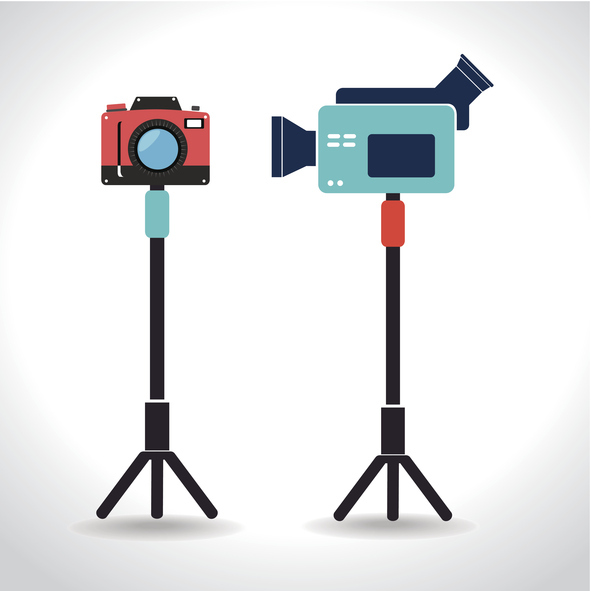 Our Tips & Tricks series educates readers on advanced tricks of the trade for video. The series comes from the expertise of outside experts in the field. This piece focuses on how to broadcast live content through a multi-camera live streaming webcast. Gregg Hall, the author, joins us from Webcast and Beyond, an online video service that researches the best equipment and techniques to produce high-quality yet affordable webcasts. Gregg founded the organization in 2010. You can check out their website (linked above) for more details and background. One big advantage of live streaming today is the ability to affordably broadcast diverse events to specific audiences. The availability of low-cost broadcast equipment and video streaming platforms has opened the door for more organizations to produce live content than ever before. Likewise, with an online video platform like DaCast, it’s easier than ever before to stream live video on your website, whatever you’re streaming! 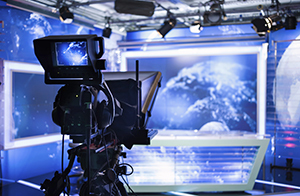 Despite this greater accessibility and affordability, many broadcasters are still concerned with maximizing production quality and reach while minimizing production budgets. And for good reason! Especially for small-scale businesses and individuals, you want to make sure you’re getting the best features for the best live streaming pricing plan with minimal technical complications. The streaming solutions you choose can have a big impact on your reach, your professionalism, and the viewing experience of your users. 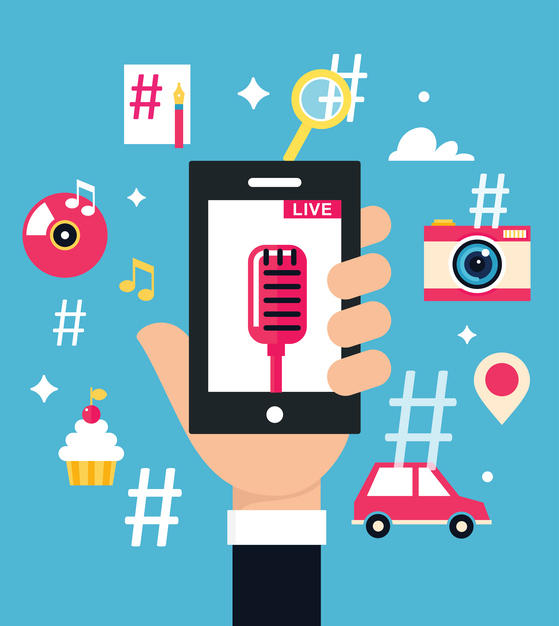 In this article, we’ll consider one particular approach to broadcasting live video streams. 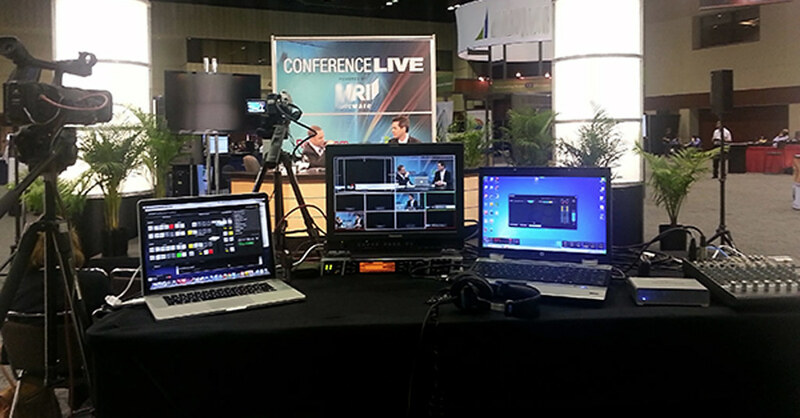 Specifically, we’ll talk you through how to set up a multi-camera live streaming webcast–all with a one-person crew! Before we get started, it’s important to note that this approach does not work for every situation. We hope that by reading this article, you’ll have a better sense of what factors to consider when deciding whether one-person, multi-camera live streaming is feasible for you. As we’ll discuss, however, there are many events for which this approach is not only feasible. In these cases, operating a one-person multi-camera live streaming setup can also support greater business opportunities. For example, by keeping production costs to a minimum, you may be able to free up resources for other projects or goals. With the above context in mind, let’s take a closer look at the necessary roles and design requirements for successful multi-camera live streaming. First, your system must be equipped to shoot in HD (high definition). These days, it’s easier to acquire affordable cameras that shoot at 1080i and output either an HDMI or HD-SDI signal. I can’t overstate the importance of shooting in HD, even when you’re streaming at SD (standard definition) bit rates. HD sources have significantly higher visual quality than SD sources, even when encoded at lower bit rates to accomodate a diverse viewership. Secondly, your system must be portable. By portable I mean one person can transport the whole system alone when traveling by plane. Thirdly, the layout must be ergonomically efficient. This is important because it enables a single person access to all of the controls. Cameras – You’ll want two or more HD cameras with HDMI or HD-SDI outputs. Many options in the $2k – $5k range are readily available. For example, check out the Canon XA25 HD camcorder priced at $2.5k. This camera has a 20x zoom lens, XLR audio, HD-SDI & HDMI outputs and is compact enough for travel. Make sure to select fluid head tripods that fold up compactly enough to fit in a suitcase. Switcher – Seamless switching between the various cameras–along with the ability to add transitions, effects and graphics–is a must. Some viable options include software-based products such as Telestream’s Wirecast, hardware switchers including the Black-magic Design ATEM Television Studio, or all-in-one streaming boxes such as the Livestream HD500. 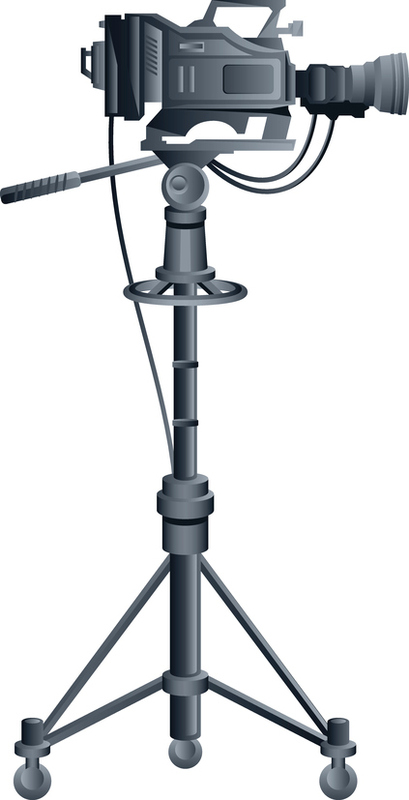 Audio – For some events, a few wireless mics will be sufficient. More often than not, there will be a live sound system to which you can connect. I recommend bringing your own small audio mixer to control the level of the feed you receive. With your own mixer, you can also add your own ambient mic. The mic can capture the audience and venue sounds not picked up by the PA system. Another consideration is maintaining sync between the audio and video. Typically the video switcher introduces a delay of 2-3 frames, which means you want to delay your audio by the same duration. Sometimes the solution is to route the audio output of your mixer through one of your cameras. That way, the audio becomes embedded with the video inside the camera and is brought into the switcher through one of the video inputs. The switcher then maintains the audio/video sync on its own. However, if you bring the audio directly into the encoder, you will need an audio delay unit to compensate for this lag. Encoder – You’ll need a hardware or software encoder with an HD input to create your video stream. Options include live stream encoding software and hardware encoders. I prefer software encoders such as Flash Media Live Encoder or Wirecast running on a laptop. Make sure you select the best encoding software settings. 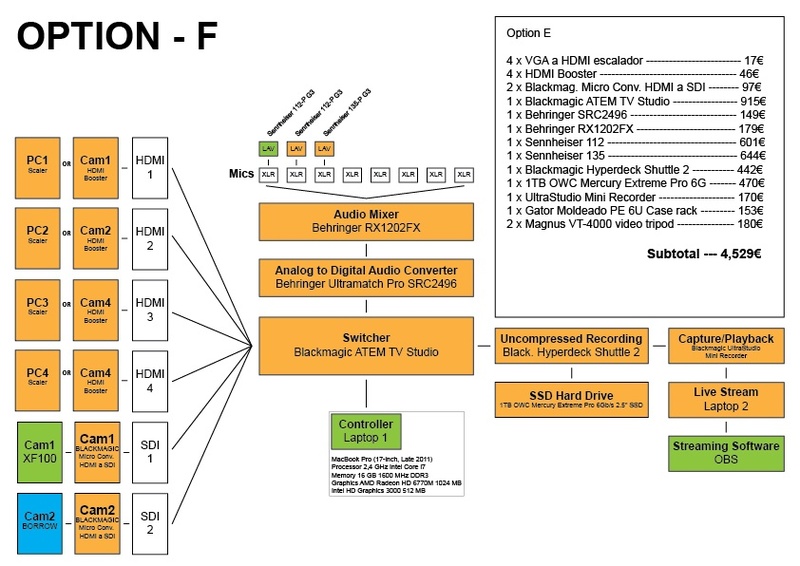 A video capture device with HD-SDI or HDMI inputs will be necessary to bring the video into the computer. Black-Magic Design and Matrox offer many low-cost solutions for this component. The photo to the right is one of our portable systems deployed at a trade show. I was the one-person crew controlling the two cameras, switcher, audio mixer, and encoder. In this configuration, two cameras are connected to a Black-Magic Design ATEM Television Studio Switcher. The switcher is very compact and affordable with a list price of only $1000. To use it, you employ a laptop as an external control surface and a field HD television as a multi-view monitor. The ATEM has 6 inputs and HDMI / HD-SDI outputs. It also features a real-time H.264 output for recording an archive of the program stream. The HDMI program routes out to a Matrox O2 Mini external video capture device. This device, in turn, connects to a second laptop, which acts as the encoder. A Mackie 1202 mixer receives a feed from the house PA system. The output then goes to a Behringer DEQ2496 processor. The processor delays the audio 2 frames. Then it converts it to a digital AES/EDU signal for input to the ATEM switcher. Also included in this system is a Matrox DVI convert. This convert transcodes the screen of the host’s computer into an HD video signal that you can switch to a video source. A pair of studio headphones monitors the audio from the Mackie mixer and also the encoder laptop. Finally, the encoder laptop also serves to monitor the webcast. Operating all of this takes some practice. Once you have it down, however, the end result is quite astonishing. There’s one basic camera technique you should keep in mind. Designate one camera as your wide/master shot (the camera positioned in front of the table). Designate the other for your close-ups (positioned just to the left of the switcher). You’ll spend most of your attention framing the close-ups. When you need to change angles, switch to the wide shot until your new close-up is framed properly. You may need to adjust your master shot from time to time. However, you typically use this camera to fall back to when you lose your close-up. The idea is to avoid panning and zooming to cover the action. You should refrain from panning unless you’re actively tracking a moving subject. What to do when you need to take your attention off of the close-up (perhaps to make audio adjustments)? It’s best to shift to a wider shot until you can resume full attention to the camera work. In terms of portability, the setup I describe above fits into two suitcases, plus a carry-on for the computers and a carry-on backpack for the cameras. In this case, you will incur checked baggage fees. However, you can travel with all of your gear as opposed to shipping it ahead separately. In some cases, you may need to hire a second camera operator. This may be the reality when there is a lot of arbitrary motion to track. I have found, however, that the one-person approach works exceedingly well in a majority of cases. I hope this article has offered you a clearer understanding of how multi-camera live streaming works. Additionally, I hope you now have greater insight into how you can make it happen with a one-person crew. Whether you want to stream live video on your website, broadcast live sporting events, or incorporate live streaming into your business or professional organization, knowing how to do multi-camera broadcasts can take your content to the next level. Do you have further questions, or comments about your multi-camera live streaming experience? We’d love to hear from you in the comment section below. For regular live streaming tips and exclusive offers, you can join the DaCast LinkedIn group. New to DaCast and interested to try out our white-label streaming solutions for yourself? Why not sign up for a 30-day free trial (no credit card required)? That way, you can test out all the features before making a commitment. We’d love to get you set up today! Good luck with your own multi-camera live streaming setup, and thanks for reading! 1) Wirecast also has an audio delay, so you can sync audio there without the need for a delay unit. 2) That’s a very advanced mobile setup, but it’s certainly possible to pare down on equipment even more. For example, you can actually run the ATEM TV Studio and Wirecast on the same laptop, using a single capture card. Or, if you just want to go software switching all the way, Wirecast + two capture cards will work very well. 3) There are a lot of great, small and very portable hardware encoders and streaming boxes that can be useful on location. The Teradek VidiU and the Matrox Monarch are two such examples. Good points! Regarding the audio delay in Wirecast I believe that function is only available in the Pro version, not the standard – but still it is nice to have this integrated into the software package. The Behringer DEQ2496 processor which I mentioned also has a compressor/limiter built in which is useful in a one-man scenario. 1. The laptop running ATEM software is also capturing a high-res archive, which is protection in case the Wirecast computer crashes. 2. Since I am monitoring the webcast on the Wirecast PC (the encoding computer), there is not enough screen real estate for the ATEM control panel, plus the Wirecast app plus the browser for watching the live stream. 3. When I travel, I like having two laptops just for redundancy; if one fails it is possible to reconfigure as you suggest and run everything on one machine. Gregg, first of all, this article is very informative and useful for me and alot of other people as well. as i get set up to do this, i’ve got a couple of questions regarding capture. i’ve got a PC with a thunderbolt, but unfortunately, black magic capture devices are geared strictly to macs right now. so a black magic salesman is trying to convince me to buy a capture device that you use in a usb 3.0 port. I’ve never heard of capturing through usb 3.0 so i’m a little nervous about it. Is that an acceptable way to capture for lives streaming?Also, i’ve seen advice that the use of sdi outs on my camera are preferable to hdmi, since you don’t see as much signal loss on sdi with long cable runs. do you agree with that? also, considering the audio delay with wirecast’s entry level version mentioned in these comments, does that tell me to go with WC pro all the way??? If you have Thunderbolt, I highly recommend the Black-Magic Design UltraStudio mini-recorder for $145. It has both HDMI and HD-SDI inputs which then feed into your PC over a thunderbolt cable. Wirecast Standard or Pro will recognize this input. Regarding USB 3.0, yes, this is a viable option but you have to be careful to use a PC that is certified to work with the BMD hardware. The issue is the USB chipset and firmware onboard your computer; be careful to select the right PC or it won’t work! If you have a choice, always go with SDI connections since you can achieve cable runs of up to 300 feet and do not need to worry about some of the irratic behaviors associated with the HDMI protocol. Lastly, Wirecast standard should be fine. If you bring your audio into one of your cameras then the audio and video are synchronized going into Wirecast so that you won’t need audio delay within the program. Hopr that helps! very helpful for sure. i appreciate it. in fact, i’ve already bought the black magic mini recorder and the sdi feed out of my camera is perfect. for some reason the hdmi out does not show up in wirecast. i suspect i need to get in touch with black magic over this issue. Thank you for this great setup, but what would be a good solution if the cameras are a bit far from your setup and must go wireless? Nils here again up in Seattle. I managed to get a video feed from my canon xf-100, to the Black-Magic Design mini-recorder and have Adobe Connect see the feed. This felt like a great step in the right direction. Now the only problem, which I believe you mentioned as a possibility, is that Adobe Connect 9, although it has a 16:9 option, is squashing the video horizontally and is pillar-boxing. You mentioned a blog that you researched offered a possible fix. I’ve been looking at the Talking Stick pod and Flash Live Media Encoder but don’t really understand what I’m getting into or if it’s even a possible solution to fill the 16:9 frame. Any thoughts? HI Nils – The moral of this story is that most webinar platforms are not friendly when it comes to hooking up professional cameras whereas webcasting solutions such as dacast.com will easily accomodate external a/v equipment. Nonetheless if you need to use Adobe Connect then the best path to take is to use Telestream Wirecast which will “see” your cameras, switch them and then output the feed as a virtual camera which allows other applications to grab it as though it was a webcam. What a journey! I indeed have had success with Wirecast for broadcasting 16:9 sd video in Adobe Connect without distortion or horizontal squishing of the frame. Thinking that I had enough to do a nice production, I picked up a Focusrite Scarlett 18i8 usb audio interface to pipe in the audio of 4 lav mics. Sounds great in theory, but it appears that Wirecast can only see one channel of the device. Doing some research I’ve found some people have used software solutions like Audio Hijack and Soundflower to work the signal into Wirecast. Others just run an analog out from the mixer into the computer audio in. I have a new Macbook Pro that no longer has an analog input. Seems like I might need to return the Focusrite (such a nice interface darn it), pick up a usb to 1/8′ adapter with a headphone jack, and use the analog out of a traditional mixer. Long-winded way to ask, how do you deal with multichannel audio running into Wirecast. It seems really surprising that Wirecast doesn’t want to play nice with a multichannel digital audio interface. Am I overlooking something? I can’t seem to make this work. Could you eleborate? Wirecast and adobe connect don’t seem to work. Thank you reading us! Because the comment you are answering is now two years old, OP might never see your comment and answer it. Nils – Take the output of your mixer and feed it to the XLR inputs on your camera. This will embed the audio with the video signal coming from the camera’s HDMI output jack. Wirecast will now see both audio and video from the Black Magic ultrastudio mini recorder external capture box. I plan to use 3 cameras connected to this Roland mixer http://www.bhphotovideo.com/c/product/1198625-REG/roland_v_1hd_4_x_hdmi.html. I also will use some external audio mixer just like you, in which I will plug 3 lavalier microphones. Is there any way to control all 3 channels separatly for possible latency (not sync with the video). Roland has the option to control each audio channel, and add up or take up to 500 ms, but when I output the master from the audio mixer, that will be group off all 3 channels in one, and will treat them as one channel, so I will not have control of individual tracks for any possible latency. Is there any way I can do this in the mixer itself? I know I can connect each microphone to the camera, and deembed sound coming from HDMI and then control each track individualy, but how can I control each of them for latency if I want to use external audio mixer. Hi, this is an interesting article. I’m in the process of setting up a similar business in the UK but I have no idea of rates. How much do you charge your clients for a setup such as pictured? Good morning Jimmy! Thank you for reading us! I will try to answer all your questions the best I can. 1&2. You can often use the same laptop but there are some less powerful systems where we would recommend using two different computers. Otherwise you should be just fine. Typically, when using the ATEM switcher you would dedicate one laptop to run the ATEM, performing switching operations and recording a very high quality H.264 archive stream via a USB cable from the ATEM to the laptop. The switched output from the ATEM would then be routed to an encoder, which could be a second laptop loaded with Wirecast (I wouldn’t recommend running both applications on the same computer). The ATEM can’t encode an RTMP stream, but as mentioned it does create an excellent H264 MP4 archive. Since the ATEM handles all of the camera inputs, only one capture device is needed on the second laptop to encode the program video. You don’t need the ATEM if your laptop has multiple capture ports available and is powerful enough to handle the load (2 or more cameras + graphics + streaming + recording to disk). 3. The Matrox Convert DVI is one of several devices out on the market which acts as a scan converter to transcode the output of a computer’s graphics card into an HD video signal that is compatible with a video switcher, or other capture device. I doubt that the Epson EB-1975W projector will output the correct HD video format (typically 1080i @ 59.94 Hz)over its HDMI port unless that is the format originating from the host computer. Some high-end laptops are capable of outputting HD compatible video in which case the Matrox unit would not be necessary. I hope it will help you complete your setup. 1&2. Indeed, you should be able to make the stream run even with using the ATEM only. The Matrox would free your laptop of some of its workload, but I would still advise you to run some tests before considering making this purchase. You laptop could be powerful enough to handle the streaming and the recording. It would be better to be 100% sure you need it. 3. Spending a little more on the ATEM Production Studio 4K could be interesting as you’d be good to go for a longer time without thinking about changing. You’d be investing for the future. But yes, I would still recommend you testing only using the ATEM and your laptop. If your CPU & GPU get overloaded, it would then be time to consider the ATEM. Looks all good. Happy streaming!